Do you know what a notoungulate is? How about an astrapothere, a necrolestid, or a sparassodont? These are just a few of the fascinating mammals that once called South America home. Unfortunately, these and many other ancient South American mammals left no living descendants and have no close living relatives. As a result, they are unfamiliar to most people, and all that is known of them comes from the fossil record. This book provides a thorough yet accessible introduction to more than 75 extinct species from South America through vivid life reconstructions by Velizar Simeonovski and short narratives about their characteristics, paleoecology, and evolutionary relationships. These ancient animals are examined in the context of 15 significant paleontological sites from throughout the continent that have produced fossil remains of these and many other species. Photographs of sites and specimens help illustrate how paleontologists bring extinct species to life through a combination of fieldwork, collections research, and comparisons with modern species. 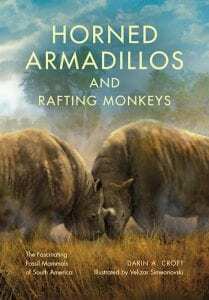 If you are interested in living mammals, extinct species, or the natural history of South America, you will enjoy this volume immensely. 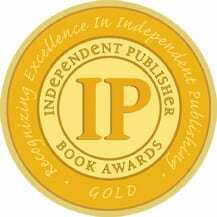 Horned Armadillos and Rafting Monkeys won a gold medal in the Science category in the 2017 Independent Publisher Book Awards or “IPPYs”. Published by Indiana University Press. More information can be found on the publisher’s web page and on the Google Books preview. You can order it from the publisher or from Amazon.